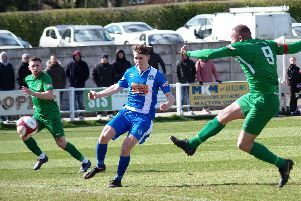 BRIGHOUSE TOWN will open their 2018-19 season in the new Evo-Stik NPL Division One East league with a home game against Derbyshire club Gresley FC on Saturday August 18 (3.0). The following Tuesday they make the first of two long trips to the North East, to Northumberland outpost Morpeth. Last season, in the old Division One North, they had a trip to South Shields, which is sandwiched between Sunderland and Newcastle, in their first Tuesday game. Brighouse have a busy August Bank Holiday weekend with a home Emirates FA Cup preliminary round tie against either Parkgate Steels or Sandback Utd on the Saturday and a visit from the newly merged Ossett clubs, playing under the Ossett United banner, on the Monday. Town will meet a whole host of new clubs in this division, including a 134-mile trip to Wisbech in Cambridgeshire on Saturday, January 19. They will have Sheffield FC, the oldest club in England, visiting them on Boxing Day and on New Year’s Day they will travel to Ossett.